Spring is coming! 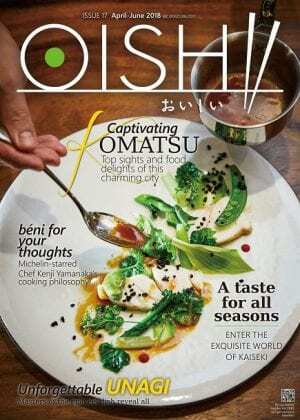 OISHI Vol. 17 continually introduces the fascinating stories about Japanese foods and culture. This issue focuses on the appeal of Komatsu City which is in the south-west part of Ishikawa Prefecture, offers a good mix of the traditional and cultural, and the modern and cute. ・A food culture – Introduce tofu products; ganmodoki, yuba and koya dofu. ・Shime like a star – Chiemi Isozaki of the Sapporo Shime Parfait Promotion Committee tells us about a cool new trend of the parfait. ・Unagi – Can you “eel” it? Grilled unagi is fast gaining popularity in Singapore, with three speciality restaurant vying for the top spot. ・A feast for the senses – Unsure about enjoying a Japanese kaiseki meal the correct way? Fret not – here’s now.